While I was working at MOHAI, a semi-famous local historian mentioned to me the fact that there is all this historical data, but that no one is doing anything to help people visualize it. He was referring to the murky information we had on the streetcar lines in Seattle and their dates of being built, but the point he brought up was valid. “Big Data” has become a buzzword among those of us who love technology, but it’s promise is undeniable. We now have the ability to catalog and maintain all the knowledge we as humans have acquired and quantify it in surprising ways. Which is super exciting for history nerds because theoretically, we should be able to type into Wolfram Alpha “how much elevation was lost in the Dearborn Street regrade in Seattle” and it should just know, cause the data is out there. However, most of this data is not digital… yet! So my ambitious dream was for MOHAI to implement a Seattle-wide online portal where anyone doing research could fill in their findings in a quantifiable way. So if Sally found out the names of the inhabitants of 1442 Rainbow Lane in 1951 were Terrence and Patricia Unicorn, she could fill that in and it would be a quick little search for Rebecca Unicorn to find out the first house she grew up in before the Unicorns had to move to Idaho for Terrence’s harebrained alpaca farming plan that Patricia just knew would never amount to anything. Crowd-sourcing history. I left MOHAI before anything could be started on the project I dubbed Block by Block (because I can’t dream of anything that doesn’t have a name or logo). So, months of unemployment later I decided to start the Block by Block project myself with a block I know well: my own. There are a couple of things that made me want to start here. This has mainly been a residential block, which I like. It is a bit of a transition zone from the shopping/business district and the more residential neighborhoods on First/Capitol Hill. 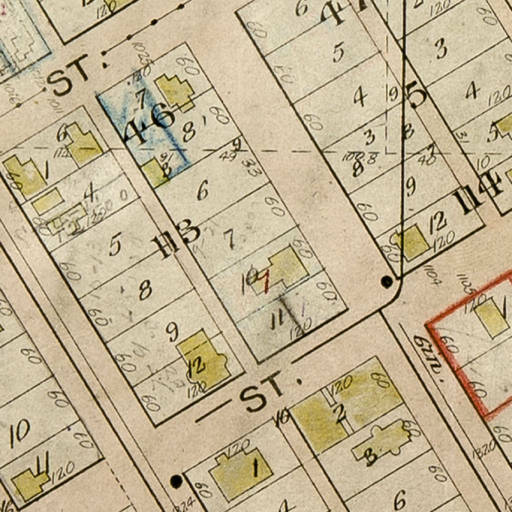 It didn’t get really going as a block of buildings until after 1900, so a bit fewer years for me to research! I wanted to. I made up the project. I can make up the rules! At the beginning, I’m going to limit the stuff from 1900-1910, both because that’s the decade that many of the buildings were built and because it’s the start of a century. Th title comes from the fact that most of this block is referred to as Block 113 of A.A. Denny’s Broadway Addition. A tiny sliver to the north is listed as Block 46 of Sarah A. Bell’s 2nd Addition, but that’s not as pleasing to my ear. Join me next time for the skinny on the first building I’m going to talk about, the Altamont. Ciao! This entry was posted in Uncategorized and tagged A.A. Denny's Broadway Addition, Intro. Squeeeeee! I love fun history. There might even be *gasp* Lesbians involved!